Spoiler review pertaining to season 2 of Star Wars Rebels and the episode “Relics of the Old Republic”. Star Wars Rebels kicks off with a serious bang! Both “The Lost Commanders“ and “Relics of the Old Republic” are available to watch on the SkyGo app in the UK. This arc in particular concentrates on the Ghost crew searching for Ahsoka Tano’s long-lost friend, Captain Rex. In my review of “The Lost Commanders“ I discussed how the crew sought out Rex and his merry band of clones and the tension that came along with this meeting. “Relics of the Old Empire” picks up right where “The Lost Commanders” left us, though this time the stakes are raised even higher. At the end of “The Lost Commanders” we’re left with Kanan desperately wanting to leave Captain Rex and company to return to the Ghost. Ezra is hesitant and wants to stay and assist the clones after they learn via transmission that Agent Kallus wants to meet with them to investigate Commander Wolffe’s report on a Jedi being present. With the Phantom’s engines damaged after the imperial probe droid attack, and a dangerous storm closing in on the old AT-TE, the Rebels are forced to stay and face Kallus once again. Ezra is overjoyed by this turn of events… Kanan, not so much. Knowing the Empire will arrive at any moment, both the Ghost crew and the clones prepare for battle. There’s a great moment when you see the clones faces light up at the thought of a good fight again; a scene that really throws you back to the days of The Clone Wars. The Empire has landed! Captain Gregor looking through some binoculars discovers three AT-ATs approaching them in the distance. Rex is absolutely stunned to see these beasts of the Empire have four legs (Rebublic AT-TE’s have six) and shouts hilariously, “How do they walk?” Captain Rex demands they put their foot on it and gain some ground. With Wolffe at the controls of the trusty old AT-TE they start putting some distance between them and the approaching Imperial walkers. When Kallus’ targets get in range, they begin firing on the old clones’ transport. Sabine makes a great call and tells them they need to get a shot on the neck of the AT-AT (its weak spot)! I’d like to think she figured this out from all the Imperial records they retrieved from the Rodian Zeebo in season 1. As the AT-ATs pick up speed and begin catching up with our heroes, Kanan decides moving into the storm is a wise idea as he can use the Force to see, even when the scanners go down. 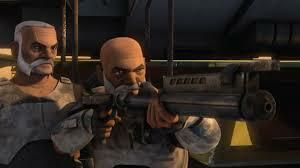 Captain Rex agrees and reassures the crew that if anyone can do it, a Jedi can. It’s these small reassurances that begin easing the tension between Kanan and the clones, and it’s definitively what us, the viewers, want. With the gang in the thick of the storm they become surrounded. Agent Kallus who is commanding one of the AT-ATs knows they’re there and commands the walker drivers commence a manoeuvre that will surround the Rebels. This is a really tense moment where neither parties really know where each other are, and it’s kind of a guessing game. It leaves you on the edge of your seat biting your nails! It’s at this moment where Rex hands his helmet to Ezra, and tells him to go up on top of their walker to man the main gun. Ezra seems really touched by this; however this moment is cut short when Sabine grabs him and drags him up top. We now get to see Ezra go through another test as he is unable to see the Imperial walkers’ necks and has to use the Force as his guide. Ezra does so with precision and takes out one of the walkers with a tremendous shot. Well done, Ezra Bridger! I was actually cheering for the kid that I didn’t care much for in the previous season. Agent Kallus uses his combat experience and demands his pilots to approach the power surge. With one walker down, the Rebels and the clones aboard the old AT-TE make a break for it. After they escape the storm cloud, Kanan decides it’s time to leave as it’s the only chance they’ll get to escape without being shot down which leaves Ezra upset as he does not want to leave his new friends to go fight alone. Despite Ezra’s bargaining, the Ghost crew departs leaving the clones to fight off Agent Kallus’ walkers. 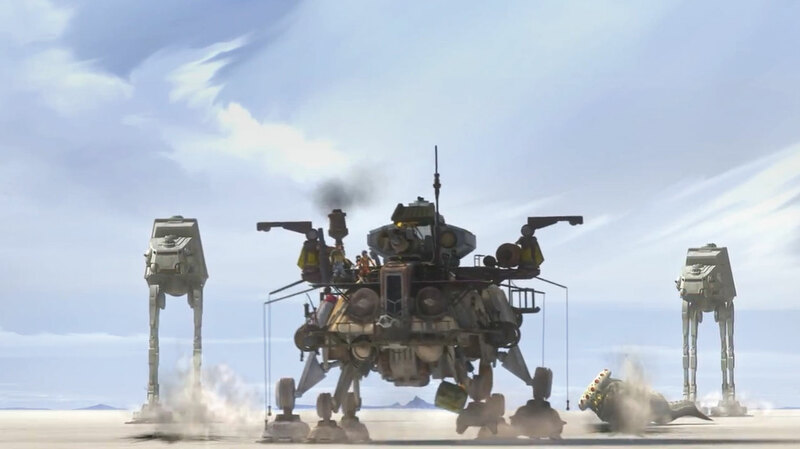 With the Ghost crew gone, Captain Rex and his fellow clones go for one last charge at one of the AT-AT walkers. It is a desperate moment as their Old Republic walker is being hit critically by Kallus’ mass-produced Imperial walker. Wolffe puts all power in the front legs and they begin lifting the imperial walker of the ground like a horse rearing on its hind legs. At this moment you’re left with one eye closed wondering if they’ll actually make it out alive. Kevin Kiner’s score adds so much to this sequence, and to be quite honest the whole episode. However, it is in these particular moments that Kiner really shines. As the Rebels return aboard the Phantom to save the day, Sabine, Ezra, and Zeb leap out onto the AT-AT’s head, cut through, and Zeb takes out the walker driver in classic Lasat fashion: good head bang! They then turn on Kallus’ walker in a scene very reminiscent of that on Endor, when Chewie and the Ewoks hijack an AT-ST and turn it on the Imperials. Taking out Kallus’ command walker, the victory is theirs! The next shot is one of pure comedic splendor as we see Kallus and one of the AT-AT drivers escape on a speeder bike. We then see the second driver running after them waving his arms, a laugh out loud moment for me. With a well-earned victory, and a lucky escape, the Ghost crew (along with the clones) returns to the Rebel fleet. The next scene could potentially be seen as one of the greatest moments in animated Star Wars history. The crew convenes with Ahsoka Tano to discuss the success of their mission. Captain Rex walks stands out from the group. Both Rex’s and Ahsoka’s faces change completely, after a quick exchange Ahsoka throws her arms around Rex, after Rex says “It’s good to see you Commander Tano,” and slowly raises his arms and the two have a long heartfelt hug. It’s a truly magical moment that honestly bought a tear to my eye. In the last scene of this episode we move over to Admiral Konstantine’s Star Destroyer, where he has been ordered by Darth Vader to intercept his shuttle. As the shuttle lands and the landing ramp flies open, we are introduced to a new, villainous character. At the surprise of Konstantine, the new male Inquisitor strides from the shuttle and out in to the hangar. The Admiral acknowledges the new Inquisitor, who towers over him. He says he thought he was sent to pick up Lord Vader, the Inquisitor replies by saying he has been sent instead. He goes on to say, “I will succeed where you and Agent Kallus have failed.” This new Inquisitor looks and sounds terrifying and it seems the Ghost crew’s struggles have only just begun. Star Wars Rebels Season 2 starts off with a bang and shows no signs of slowing down.